When you visit the beach what birds do you expect to see? For us here on the east coast seagulls, sandpipers, and plovers are probably some of the first to come to mind. If you live on the west coast maybe it is more along the lines of Albatross and Terns. While we see different birds at our local beaches, there is one similarity that they will all share. Within the next 40 years, they will all have some form of plastic in their stomachs. Plastic, as you know, is a common commodity in life today. It would be near impossible to live a life without using plastic-based products in modern society. Yet as common as plastic is today, plastic has continued to be produced at a high rate. The amount of plastic in the world has doubled roughly every 11 years since its introduction in the 1950s. ( B. Hardesty, E. SeBille, C.Wilcox) As plastic concentration increases in the world, it increases in the ocean as well. 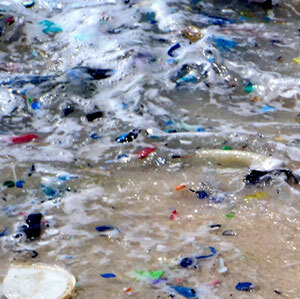 Concentrations of up to 580,000 pieces of plastic per km^2 have been observed throughout the ocean. ( B. Hardesty, E. Sebille, C.Wilcox) That equates to approximately 1,502,193 plastic pieces per mile^2. These numbers are not only high, but they are consistent too. 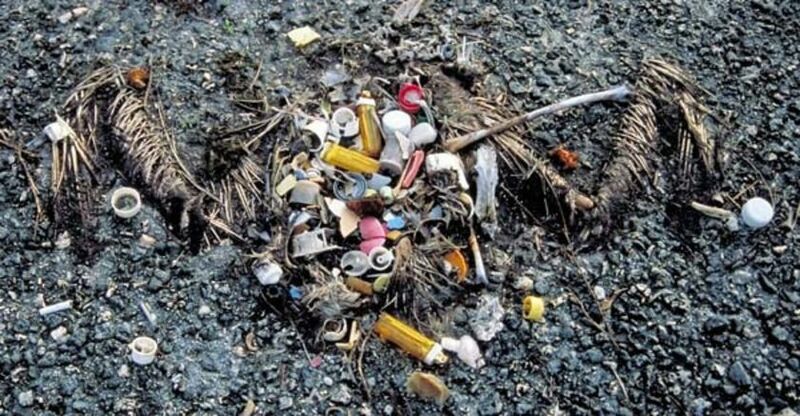 Global studies have shown that these high concentrations of trash are fairly consistent across the world’s oceans. “Modeling studies, validated by global sampling efforts, demonstrate that plastics are ubiquitous, with high concentrations in all five subtropical convergence zones and along the coastal margins near human population centers.” ( B. Hardesty, E. Sebille, C.Wilcox p. 1). This figure will only grow larger with more and more plastic being produced. This is due to the fact that plastic has a tendency to not break down under natural circumstances. It is not a natural compound, and as a result, it is extremely durable when exposed to natural conditions. So while larger and larger amounts of plastic are added to the environment each year, the plastics that were previously disposed into the environment will still be there creating a pileup effect. This creates massive problems for sea life, particularly the world’s populations of seabirds. Naturally, large amounts of plastic being deposited into the ocean are not good for the organisms that live in ocean environments. A recent study was done by the United Nations that found over 600 species were negatively affected by plastic through entanglement and ingestion ( B. Hardesty, E. Sebille, C.Wilcox). The species that they recorded ranged from microorganisms to whales, showing how broad the spectrum of organisms that is impacted by plastics is. Of these organisms, the group that seems to be most impacted are the seabirds. This percentage may not seem huge, but to put that in perspective, roughly 1 out of every 4 birds you see at the beach had plastic in its stomach between 1962 and 2012. They then took this data and created a regression model to predict what percentage of birds had plastic in their stomach in 2015. What they found was shocking. Their model predicted that 90.4 % of the seabirds on the planet would have some form of plastic in their gut if a study was conducted in 2015. This could be due to the huge amount of plastic that is produced, and that will continue to be produced. “Global plastic production is increasing exponentially, with a current doubling time of 11 y; thus, between 2015 and 2026, we will make as much plastic as has been made since production began.” ( B. Hardesty, E. Sebille, C.Wilcox p. 3). They also created a model to show the future of our seabirds and their plastic consumption. By what they found 99.8% of seabird species will have ingested plastic by 2050, and 95% of the individuals within those species will have consumed plastic pieces. This means that by 2050 only roughly 1 out of 20 birds you see at the beach will not have plastic in its stomach. You are probably thinking to yourself, “Well how could that possibly be, I see a million birds every time I go to the beach there is no way they have all eaten plastic!” Well, I might have found it hard to believe too, had I not been a part of several beach cleanups with “The Ocean Notion”. The problem doesn’t lie in the big plastic items such as bottles laying on the beach. It lies in the broken down plastic, the small fragments that come off of larger plastic items. When conducting our beach cleanup we found large amounts of small string-like plastic fragments mixed in amongst the large amounts of seaweed that were washed up. This could be a big source of the problem, as seabirds (seagulls in particular) are known to forage these piles of seaweed for detritus (deceased organisms) as well as crustaceans and mollusks. This is where a large amount of the plastic is likely consumed, and anyone visiting the beach would likely not know it is there if they weren’t looking for it. That is why plastics need to be removed from the environment before they break down into these small, consumable pieces. While there is no way to remove all the plastic that is in the ocean or to stop all the plastic that is going to enter the ocean, there is a way that we can all contribute to helping slow this process down. Whenever you go to the beach bring a reusable bag and pick up plastic items that you come across. I bet you that you would fill that bag every 9 out of 10 times (depending on the beach you visit). Try to reduce a number of plastic items that you use. And for the plastic items, you do use, be sure to recycle them. The final thing you can do is probably the easiest of all, and that is to spread awareness about plastics in our oceans. Let everyone know about just how devastating plastic can be to our wildlife, and how they can help to reduce these impacts. After all, two pairs of hands helping a cause is better than one and at the end of the day, we’re all fighting to save our beautiful beaches and the wildlife that inhabit them.